Anarchists,Flashbangs and Smoke at RNC | the "silent" majority no more! ← HotAir, The DNC and P.E.W.P. Also from Twincities Press: Officials of the joint force in charge of security for the RNC are asking for help to identify the victim of an apparent assault that took place during Monday’s protest-related violence. 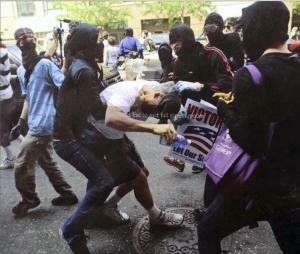 Masked, black-clad protesters attacked the apparent victim on a day when nearly 300 RNC-related arrests were made. The Joint Information Center is also asking for help to identify the individual pictured breaking windows of the 1st National Bank building in St. Paul, also Monday. Demand the phony charges against the RNC protesters be dropped immediately! Fire Assistant Police Chief Matt Bostrom and Ramsey County Sherriff Bob Fletcher! We need a people’s investigation of RNC-St. Paul Police criminal activity during the RNC! Sign the online petition to send a message to the Minneapolis-St. Paul Police, Bush, Cheney, McCain, RNC, the Minneapolis and St. Paul City Councils, the Minnesota Gov., Congressional Leaders and the media to drop the phony charges against RNC protesters IMMEDIATELY! Demand a Peoples’ Investigation into RNC-police criminal activity during the RNC!! DONATE to keep us in the streets! Over the past week, we have witnessed a truly shocking display of police violence, illegal raids, use of chemical weapons, and targeted arrests of independent media activists, all part of an attempt to silence and intimidate dissent in St. Paul during the RNC. Minneapolis-St. Paul Police: Drop the Phony charges! Fire Assistant Police Chief Matt Bostrom and Ramsey County Sherriff Bob Fletcher! We need a people’s investigation of RNC-St. Paul Police criminal activity during the RNC! I condemn the violence, provocations, and illegal raids and detentions carried out by police in St. Paul during the Republican National Convention. The Republican Party and the Police began the week with illegal raids on the Convergence Center and other locations, an outrageous attack on the rights of people to protest at the RNC. Dissent is not a crime. The Police, acting on orders from the RNC, clearly intend to use tactics of fear and intimidation to impact the days of protest planned for over a year by hundreds of justice and anti-war organizations. 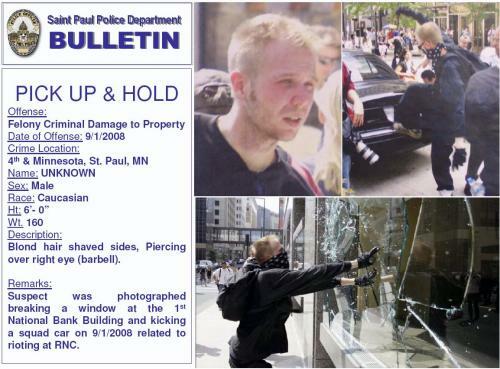 When these tactics failed, the St. Paul Police turned to brutality in the streets to attempt to stop these protests. The Police followed their illegal raids with a week of violence and provocation, including the use of chemical weapons like pepper spray and tear gas, numerous documented acts of brutality, and the targeted arrest and detention of independent journalists, legal observers, and organizers. The Republicans and the Police labeled the protesters as ‘violent,’ but the events of the week show that there were only two groups of people in St. Paul who intended to commit criminal acts of violence. The first group is the Police, specifically the St. Paul Police, and Assistant Police Chief Matt Bostrom, who was in charge of convention security. Their acts of violence and brutality were clearly intended to silence and intimidate opposition to the RNC. The second group of people who were in Minneapolis-St. Paul with criminal intent were the delegates, corporate lobbyists, and politicians who were participating in the Republican National Convention. They were conspiring to continue the illegal war in Iraq. They were conspiring to wage another illegal war against Iran. They were conspiring to steal money from working people and use it to fund tax cuts for the wealthy. They were conspiring to continue to violate basic human rights by engaging in illegal wiretapping, surveillance, and police brutality at home, while running torture camps such as those in Guntanamo, Bagram, and Abu Ghraib. The thousands of people who came to protest at the RNC were not criminals – they were taking a stand against a criminal regime and were met by criminal violence by police taking orders from that regime. I support and defend the right to protest at the RNC. Dissent is not a crime! Fire Assistant Police Chief Matt Bostrom! Oh, yeah…that’s all they needed along with their cries of ” Stop the Police Brutality” was a “Sincerely”… cause they’re such nice, POLITE little Anarchists….who took to the streets of St. Paul… PEACEFULLY!!!! !